Benetton Blu Man embodies the perfect balance between infinity & devotion. Benetton Blu Man 100ml. Eau De Toilette by brand Benetton is a citrus-woody fragrance for men. In the introduction, we find lemon fragrance in combination with lavender and then flows into the heart of fragrance, which is hidden rosemary, basil and sage. Finally enchant combination of cocoa, patchouli and cedar wood. Fragrance was launched in 2010. Head: lemon, lavender. Heart: sage, basil, rosemary. Base: cocoa, cedar wood, patchouli. Blue is the color of the sea and the sky, forming a constant color point in our lives. 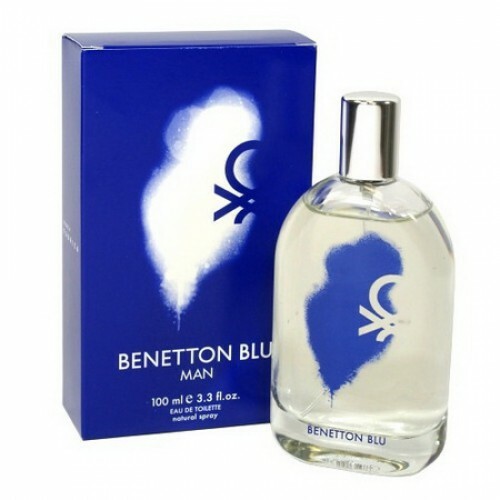 Benetton Blu embodies the perfect balance between infinity and devotion, calming and arrogance. Tangy lime combined with lavender, rosemary oil and a velvety idea muscat sage Benetton Blu are its special charisma. The inspiration for this fragrance eau de toilette Benetton Blu Man, released in 2010 served as a blue color. He identified the topic of expression and the main emphasis of this fern flavor. Bouquet perfume embodies the freshness of the sea breeze, clean and clear skies, crystal refreshing coolness. Benetton Blu Man will be a wonderful fragrant outfit for every day for the modern man - it is relevant both for the office and for special evening events. Having high resistance, perfume Benetton Blu Man in the morning revealed scented sounds of Bulgarian lavender and invigorating notes of lemon. At the heart of this fragrance is playing clary sage and basil. Due to such a subtle blend, aroma relevant in any time of year. Noble plume revealed echoes of patchouli and tasty cocoa bitterness with woody notes of Virginia cedar. Benetton Blu Man gives its owner the confidence and emancipation, wrapping in a haze of fresh citrus fern sounds.